This post has appeared as a guest blog on FounderDating, which brings together entrepreneurs with different skill sets to start innovative new companies. Thought experiment - imagine if the (multi hundred person (?)) Microsoft Office product and engineering team suddenly disappeared (kidnapped by aliens?). The sales team could keep pushing the existing product for many years without customers noticing. Microsoft could still generate ridiculous amounts of cash off of the product, with no one actually working on it. In contrast, at a startup as the entrepreneur if you stop pushing, everything immediately comes to a halt. As a friend of mine put it, if a year into your startup you are not an alcoholic, you must be doing something wrong. Make it fun for everyone. Startups are hard work. Find key things to celebrate - e.g. for Cinco De Mayo we bought a pinata. We created our own day off in April called Numa Numa day. We did team hikes. We worked from a pub (with wifi) and drank Guinness every few weeks on Friday afternoons. We rented out a ski cabin in Tahoe for a week and did half days snowboarding and half days working. Everyone on the team was working really hard, so we wanted to make sure we found simple, cash conservative ways to reward everyone while also creating a fun environment for ourselves. Change context to decompress. After a while, working 7 days a week is exhausting. Make sure to take a weekend off to go to another city with your significant other. Or, go see friends and do a long walk. Changing context (even e.g. walking through San Francisco Chinatown if you are in SF) will help you take a break from the constant focus and worrying entrepreneurs face. Do your best to maintain key relationships. I had to cancel a pre-planned family trip with my girlfriend in order to work. She was super understanding (she is amazing in general! ), but the startup lifestyle can really stress relationships. Try to find ways to connect with loved ones on a regular basis as their support will help get you through tough times - and will help with decompression! Buy your girlfriend flowers or take your boyfriend to Sausalito. Find a way to connect and be with one another. Get sleep. This is self explanatory. Try going without caffeine for 30 days - it will make a BIG difference and force you to sleep when tired. Exercise. This will help you decompress and clear the mind. Have a hobby. This may be hard if you are working maniacal hours. However, even something you do 20 minutes a day can have a huge positive impact. By making progress on something other then the startup, you can feel like good things are happening in life even if work is especially tough. 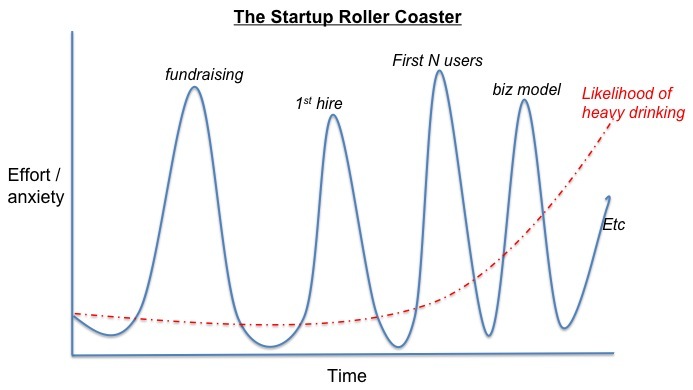 Startups are stressful but very rewarding. If you don't find ways to cope with the stress you will burn out or blow up and the work environment will deteriorate rapidly. What do you think? Any ideas for how to decompress or deal with startup stress besides alcoholism? Let me know in the comments section.